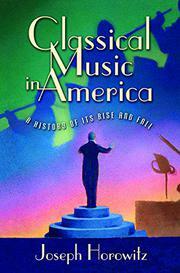 Opinionated, stimulating account of how classical music failed to establish fruitful roots in America, from orchestral administrator and historian Horowitz (Wagner Nights, 1994, etc.). In his view, the critics, administrators, and patrons who shaped the development of “serious” music in the US made two fundamental errors: they preferred Europeans to native composers, and they favored masterpieces of the past over performances of contemporary classical works. These choices were not inevitable, Horowitz argues; in the 19th century, differing attitudes in the nation’s two premiere cultural centers epitomized two potential paths. While Boston critic John Sullivan Dwight disdained “all need of catering to low tastes” and devoted himself to promoting “only composers of unquestioned excellence,” New York–based conductor Theodore Thomas aspired “to make good music popular” through concerts including light music as well as such then-contemporary artists as Wagner, Berlioz, and Dvorák. (The last of whom was an enthusiastic admirer of African-American and other native musical strains.) Sympathetically yet critically assessing American composers ranging from George Chadwick and Louis Moreau Gottschalk to Steve Reich and John Adams, the author sees them generally swamped by the “culture of performance” that arose in the early 20th century and still dominates US conservatories and concert halls. Toscanini conducting Beethoven wowed the middlebrows, while Stokowski was controversial both for championing new music and for shaking hands with Mickey Mouse in Fantasia. Despite the pioneering efforts of Jeannette Thurber, who promoted opera sung in English and American musical training for American composers, and the determined popularizing of Boston Symphony conductor Serge Koussevitsky (founder of Tanglewood) and his flamboyant protégé Leonard Bernstein, classical music in the US remained the high-art preserve of the cognoscenti, to the detriment of its vitality and growth. Shrewd analyses of the role played by little-known managers like Arthur Judson and NBC founder David Sarnoff illuminate the commercial aspects of this unedifying tale. Unlike most lengthy texts, this one gets better as it progresses, drawing complex themes and a huge cast into a single overarching vision of a cultural attitude that has produced many fine artists and striking moments—but no institutional or intellectual support to sustain them.